Thanks to an impressive postseason run by the Kansas City Royals, Eric Hosmer cards are moving to the top of the hobby world. Values are starting to peak thanks to his hustle-play that allowed the Royals to claim Game 5 and ultimately the 2015 World Series title. Check out all the official Eric Hosmer rookie cards in our detailed guide below. Eric Hosmer was a big name heading into the 2008 MLB Draft, which saw him selected third overall by the Kansas City Royals. 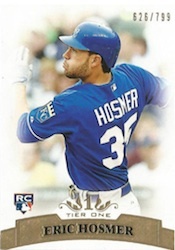 Collectors who invested heavily in the young star were rewarded in 2011 when Hosmer was called up by the Royals. Finishing third in American League Rookie of the Year voting, his card values reflect both his great start and his immense potential. He earned Gold Glove Award in 2013 and 2014 and seems poised to add more individual awards to his résumé going forward. Just seven Eric Hosmer cards can be considered true rookies. Budget collectors can rejoice as most are low-priced base cards. It's the various parallels and autographed inserts that are drawing the highest prices. Hosmer has minor league, national team and prospect cards reaching all the way back to 2007 that are also popular with collectors. 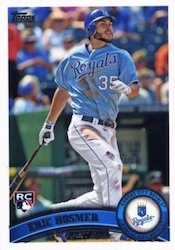 View a full guide to Eric Hosmer prospect cards. 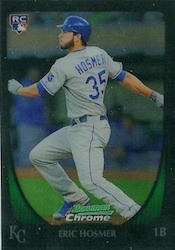 The 2011 Bowman Chrome Hosmer is a solid base rookie. The traditional Chrome look and crisp image make the card appealing for collectors on a tight budget. Refractor parallels receive a lot of interest from collectors. Bowman Sterling offers another base rookie card with an appealing design and a cost that is quite reasonable. Again, base parallels play heavily into the interest for this rookie card. The sticker autographed insert from this product is the bigger draw for collectors. 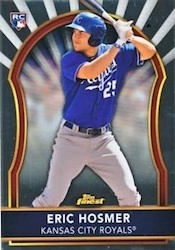 Another budget card, Hosmer's 2011 Finest Baseball rookie, which features a sunbeam design, can be found for a few bucks. Like Bowman Chrome, Finest also has several Refractor parallels that draw strong prices. 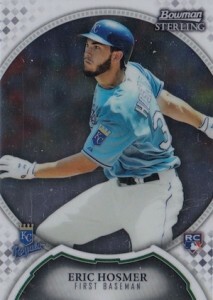 The 2011 Topps Chrome Hosmer card features a fairly standard design with the familiar chromium finish. 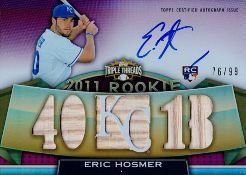 Overall, Refractor parallels from this set bring the highest values of all 2011 Eric Hosmer cards. Gold foil and serial-numbering set this base rookie apart from the rest of the 2011 Eric Hosmer cards. Although there is a lot of white, the cloud effect makes everything hazy except for Hosmer. Distributed via redemption, this is easily Hosmer's best official rookie card. With a low print run of 99, an on-card autograph and game-used bat pieces, the card has all the elements of an elite card. 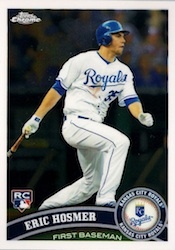 Hosmer's 2011 Topps Update card is the most plain-looking of all his rookies. The image shows a dirty and bearded Hosmer likely admiring a base hit or home run.